Gamers have their own combat choices when it comes to choosing a role-playing game. Some prefer fast-paced hack and slay battles whereas others love tactical battles. Turn-based tactical rpgs allow gamers to think and chalk out a proper plan before leaping into enemy territory. Weapons, armor and magical items along with character upgrades play an important role in battle, but it’s proper tactics and squad management that decides who will emerge victorious on the battlefield. 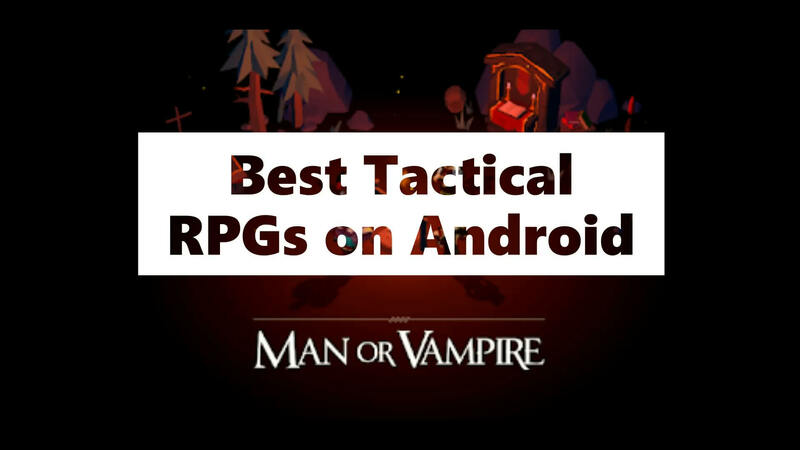 For Android, there are quite a few great tactical role-playing games that let you build a team, equip your heroes with special items, choose a line of action for each character and decide what the best squad is before battling opponents. Here’s a rundown of some of the best role-playing games that allows players to use their brains to defeat enemies. Man or Vampire has a very unique premise. The main character has characteristics of both vampire and human (hence the name “Man or Vampire”). Turn-based battles begin when you get too close to an enemy. The game boasts traditional tile-based combat. You will have to tap a character to see his actions/attack range and how far can he/she move. They are all highlighted by tiles. The outcome of the battle depends on party composition, each character’s positions and terrain. Moreover, a party member’s skills play a big role in battle. The game graphics are excellent and you can view the lush, detailed environment and engage in battles with enemies from an isometric perspective. Man or Vampire takes place in a mysterious world called Paradise, which was once peaceful, but is now infested by several deadly monsters. To save the world from utter destruction, you, and your squad must vanquish enemies. Each dungeon is randomly generated, and contains several key items of interest besides blood-thirsty enemies. Man or Vampire is currently available on Google Play and is an “Editor’s Choice” game. Lords of Discord offers classic turn-based battles in full 3D environment. A fantasy SRPG, Lords of Discord lets players build a party of heroes to fight orcs, elves, the undead, deadly monsters and factions in turn-based combat mode. Battles will remind you of Might and Magic Heroes. With the help of warriors, you can conquer territores and get resources from captured lands to fortify and upgrade your castle. You canm even recruit deadly monsters to your team before battle. The game has a PvP battle mode that lets you fight players from all over the world. Dungeon Boss is a strategy RPG on Android that lets players summon various characters ranging from epic knights to goblin warriors. The game has unique blocky, paper-craft visuals that adds some charme to the overall gameplay. Fighting enemies and huge bosses in diverse environments makes combat even more engaging and immerssive. Once you have summoned lots of characters, you can build custom teams and begin exploring several battleground. Besides the campiagn mode, there are a few more game modes, such as Challenge, “Tower of Pwnage” and the most difficult - Boss mode. And if you think your strategies are failing in these game modes, you can always watch battle replays of other players in “My Dungeon” to learn team-based tactics. Dungeon Boss is easily the best strategy role-playing game available on Android and you must install it on your device if you love fast-paced turn-based battles. Lionheart Tactics is a turn-based tactical role-playing game from Kongregate. Set in a war-torned fantasy world, the game lets you explore strange lands, recruit new allies, battle devious enemies and gather epic gear along your quest. Lionheart Tactics has amazing 3D visuals and excellent animated battles. There are over 10 classes and each class has a unique skill and tactics. The campaign mode has lots of battles waiting for you, and if you are bored playing solo missions, then there’s always multiplayer battles that will test how strong your squad is. The Banner Saga elevates turn-based tactical RPG to a completely different level. Developed by Stoic Studio, this Viking-themed game tests your decision making skills not only in conversations, but also in battles. From building a party of characters to solving problems of random NPCs, every decision you make will affect the outcome of the story. Sometimes, your choices may also lead to permanent death of a party member. The game is harder than other tactical RPGs because you don’t know the outcome of your choices. Playing the Good Samaritan does not guarantee victory in battles and conversations. You will have to take tough decisions and choose what’s right for you and your party. The Banner Saga’s battles are inspired by popular JSRPGs like Final Fantasy Advance. The game boasts lovely hand-drawn visuals and combat. Aimed at matured gamers, it has been pretty successful in drawing those who love tactical RPGs and Telltale games. Heroes of Steel is a rogue-like turn-based tactical RPG with top-down graphics. The game lets you control a party of four characters as they battle evil forces in a post-apocalyptic world full of secrets and ferocious enemies. You will have full control over your party members. You can customize each character, equip him with weapons, magical items and armor of your choice and increase his special talents, skills and attributes. The game offers a free demo prologue and four episodes that boast 40 hours of gameplay. Each episode costs a measly $1 and given the content and a brilliant plot, the game is darn cheap. Gods Rush lets you command Greek gods as they fight to restore world peace. The game combines tactical combat with role-playing game elements and features adorable cartoonish versions of Zeus, Poseidon, Hades, Hercules, Achilles and the entire Greek pantheon. Assembling a team of gods, heroes and monsters won’t be easy as each of them possess unique skills and abilities. As you progress, you will be able to collect more characters and select the best team for your adventure. This fast-paced Android tactical role-playing game will keep you busy collecting Greek gods and villains and discovering rare armor and relics that will help your squad evolve into a more powerful team. Building your own team of Gods is just a tap away! If you have played Dofus and FF Tactics Advance, then you will love everything about this game. While it is not as deep as the other two, Fantasy War Tactics still offers a satisfying tactical RPG experience. The game offers a massive fantasy world containing different types of biomes, over a hundred dungeons and plethora of characters possessing never-before-seen attack styles and skills. FW Tactics has amazing anime-inspired visuals. Characters have their own unique combat styles and the terrain affects combat. It is Nexon’s best game to date and visually it’s far superior to other tactical RPGs for Android. In Wonder Tactics, squad formation plays a key role in battles against enemies. You will need to place heroes on a 3X3 grid to fight opponents placed on square grid. Besides choosing the right formation that suits your squad’s battle style, you will also have to decide what heroes should go into the square grid. Usually the best tactics would be to place high-hp heroes on the front row of the formation, whereas the high-attack, ranged heroes in the rear focus on taking out opponents one by one. Things become more difficult when you have gathered plenty of heroes (there are over 200 characters to collect). You will have to choose the best heroes, activate their traits, evolve them and power-up their skills to ensure they don’t get defeated by enemies. The game offers more than 100 dungeons and a PvP mode where you can test you team formations against other players. Play Wonder Tactics for its unique battle system, and trust me, you will find the simple game mechanics extremely engaging and rewarding. It’s the battle between mages! Age of Magic lets you collect various characters adept at the dark arts. You will control swamp witches, raccoon mages, elves and dragonkin. The game’s fast-paced turn-based battles take place in large arenas and there are over fifty heroes to collect and recruit to your mage squad. You must build the best mage combo to defeat deadly enemies. Age of Magic has excellent cel-shaded visuals. Turn-based tactical battles are smooth and the tutorial mode in the beginning explains everything to the novice player. The game also has a PvP arena that lets players from around the world participate in a big tournament to win rewards. The story campaigns are fun to play. Besides story mode and PvP, Age of Magic offers several other game modes, such as Valley or Treasures and Tomb of Horrors. If you love a mage-centric game, then you must add this game to your strategy RPG collection.